It was the first French Free Naval Forces squadron born during the World War II. It was born as 6FE (Flottille d'Exploration/ recce squadron) on September 15th 1943. The unit was armed with eight PBY-5A Catalinas, which were replaced in October 1944 by some PV-1 Venturas. After the end of the War, it still flown the Ventura and was renamed 6F. It took delivery of some Bloch 175Ts in 1947 which were replaced by TBM-3 Avengers and TBM-3W2s in 1957. Born in Algeria, the squadron moved to NAS Hyères in 1958 in order to become a training unit. Next year, on October 6th 1959, the first Alizé was delivered. 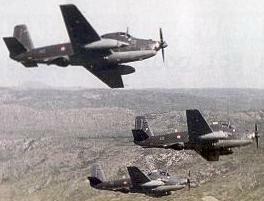 Then, the squadron moved to NAS Nîmes-Garons with its Br-1050 Alizés. It became again, in July 1972 an operational unit (training role was transfered to the 59S squadron). It took part in almost every wars (Lebanon, Iran-Irak crisis, Yugoslavia...) from the CV Foch and the CV Clemenceau. The squadron was the only still flying unit on Alizé in 1999. The squadron was disbanded on September 15th 2000 at NAS Nîmes-Garons with its venerable servants, replaced by three E-2C Hawkeye II group II of the 4F squadron. Last flight of Br-1050 Alizés belonging to the 6F squadron. The unit provided anti-submarine and Airborne Early Warning missions for French carrier groups. It was also used for maritime patrol and search & rescue missions.